« Experience the Versatile Beauty of the Philippines! 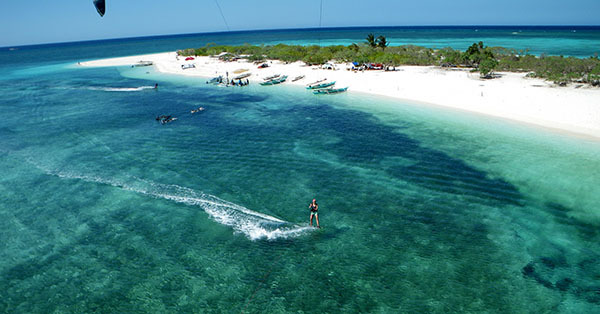 The Philippines is a paradise for Kitesurfing: consistent trade winds, warm waters all year round, 7107 Islands, countless beaches and beautiful tropical nature. Kitesurfing or kiteboarding is a surface water sport combining wakeboarding, windsurfing, surfing, and acrobatics into one extreme sport. It is a lot of fun to use the traction of a huge kite to propel yourself through the water. But you don’t just glide across the surface. You can do stunts in the air as well, such as grabs, board offs or any kind of wakeboard move. Think Iron Man Silver Surfer and Spiderman stunts combined. Now dubbed as “the new golf” by Forbes magazine, the water sport is gaining popularity among famous personalities. There’s business magnate Richard Brandson, Hollywood stars Orlando Bloom, Adam Sandler, Cameron Diaz, and Jennifer Aniston. Of course, music stars can’t be left out with Avril Lavigne and Jason Mraz raving about kitesurfing. Guess who our paparazzis caught kiteboarding in Cornwall? None other than Prince William and Prince Harry. Did I mention President Barack Obrama and presidential candite John Kerry? 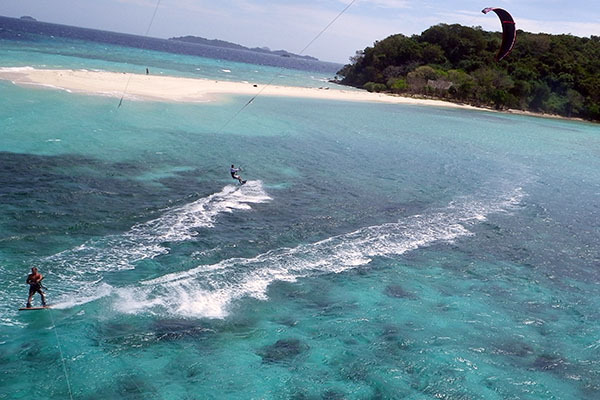 The kitesurfing craze in the Philippines started more than a decade ago on Boracay Island. Boracay is a little white-sand island. It has changed from an insiders’ tip kiting spot to an internationally known one, that can get crowded at times. Known as one of the best beaches in the world, and the Philippines’ claim-to-fame, Boracay has it all: white sand, turquoise water, breath-taking sunset, world-class hotels, and an exciting night life. Aside from Boracay, there quite a few developed locations in the country with reliable trade winds that are perfect for kiteboarding. There is Mikes-Kites in Daet, Camarines Norte, Kingfisher Resort on Pagudpud Peninsula in Ilocos Norte, Union beach in Malay, Aklan, to name a few. 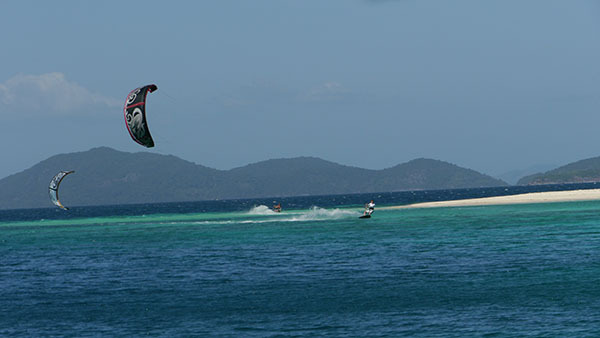 Check www.kiteboarding-philippines.com for an overview of Kitesurfing Spots in the Philippines. There are still a lot of undeveloped spots out there as well. Seco island is one of the better known ones, you can do a trip there from Boracay or get a fisherman to take you out there from Panay. Many other great spots are still undiscovered, but you need time on your hands and some adventurous spirit to go out there and explore. Do not forget: these islands are beautiful, but if you do not bring it, it’s not there. If it is your dream to have your own tropical paradise island where you can kitesurf, but you do not want the hassle of hauling all the camping gear and food around, the Philippines is a prime destination to treat yourself to it without spending much money. You can stay at a Kitesurf Camp on an uninhabited tropical island in the Coron area. These guys offer to stay at their eco-Resort, in native-style Bamboo Bungalows (Bahay Kubos). They provide everything you need such as food, drinks, rescue service in case you have a problem on the water, transportation to and from the island and daily trips to other kitesurf spots. On days without wind you can go with the crew for some island hopping or have them take you to a dive shop in the area for wreck diving. You can snorkel the world-class reef right in front of your doorstep, or simply laze around on the white beach and enjoy having a turquoise water, white sand beach paradise island for yourself. If you want to get into the sport and take some kitesurfing lessons, the Philippines is a great country to get it done. Check www.kiteboarding-philippines.com/kitesurfing-lessons/ if you want some advice on how to choose your school for kiteboarding lessons. Wondering about your options for a day without wind or if you want to do something different for a change? The Philippines also has a lot of other water sports options, such as snorkeling, diving, surfing and wakeboarding. You possess made an extremely nice weblog. Your texts is very good content material. It will be super having a widget such as Facebook such as buttom. I’ve integrated this on my personal blog also it attracts interest. The much more comments the greater motivated you’ll become within designing the next piece.